Ever wonder how the tiny town of Atherton got an institution of higher learning and what goes on behind its gates? A new book about Menlo College filled with over 100 archival photos and reminiscences of staff and alumni reveals the answers. 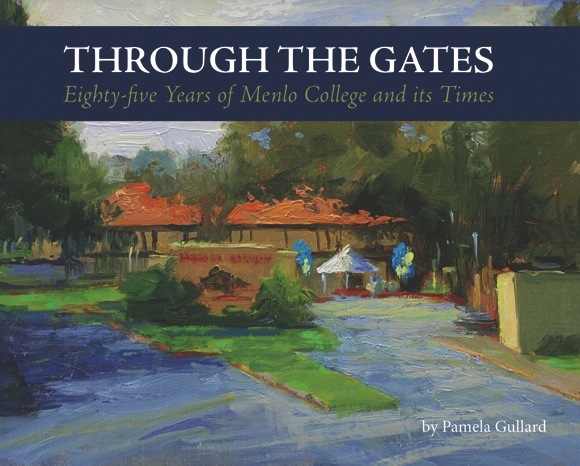 Titled Through the Gates: Eighty-five Years of Menlo College and its Times, the book sets the history of the college in the milieu of each decade. “I’ve written a number of books before, co-authored with Nancy Lund,” explains author Pamela Gullard. “Our approach is to unveil the nuggets of human interest. The book was conceived in 2012 as a means of celebrating Menlo College’s 85th anniversary by sharing the College’s legacy with alumni and friends in the community. Through the Gates traces the school’s transformation from a two-year transfer school to the four-year, coed college of today. It reveals the inside story of Menlo’s struggle through the economic depression soon after its founding, the debates over integration and the admission of women, and the effects of World War II, the Cold War, and other global events. Pamela is an accomplished writer of local history. Previous to writing Through the Gates, she and co-author Nancy Lund wrote books about Palo Alto, Portola Valley, and their latest, Under the Oaks, Two Hundred Years in Atherton. The book, with hundreds of photographs, paintings, and drawings, is a permanent record of the town’s early and modern history. Pamela teaches literature and writing at Menlo College. Her recent fiction has been published in the North American Review. She has a B.A. in philosophy with honors from Stanford University, and a master’s degree in English from Notre Dame de Namur. She and her husband Mike have lived in Menlo Park for 26 years, raising their two sons, Erik and Ben. Through the Gates: Eighty-five Years of Menlo College and its Times can be purchased online, at the Menlo College Campus Store, and at Kepler’s Bookstore in Menlo Park. How exciting. Our daughter is an academic and athletic freshman at Menlo College and after a year of visiting institutions, Menlo was the only one who she says, “Spoke to me”. Although its’ only been a few months since she began her collegiate career, and we have visited several times, I am truly excited for her, her choice and the experiences yet to come in her future. This book of yours will help us learn how it all began and hopefully will continue. Congratulations! Congratulations on your new book! So proud of you. Class of 70 at Menlo College CAN one purchase the book and have it signed? Then in Business school we has A Bush IV! Right after I graduated in 1970 lst coed class and I came back and Met one day Patty Hearst. You could write 6 books if you get Mr Dykstra to work with you…. regards from boston bill dunham jr…….. Professor Gullard gave a wonderful talk and slide presentation last night at Keplers. I attended with two of the wonderful Menlo College librarians who helped with the book–Archivist Cheryl Collins and Dean of Libraries Linda Smith. Menlo College’s new president, Dr. Moran, also spoke and welcomed community members to visit the campus.